The underlying idea of a DataFrame is based on spreadsheets. We can see the data structure of a DataFrame as tabular and spreadsheet-like. 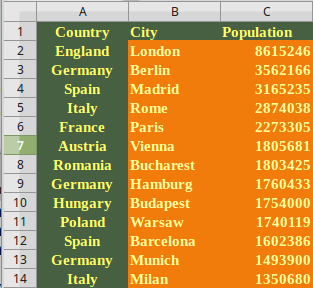 A DataFrame logically corresponds to a "sheet" of an Excel document. A DataFrame has both a row and a column index. Like a spreadsheet or Excel sheet, a DataFrame object contains an ordered collection of columns. Each column consists of a unique data typye, but different columns can have different types, e.g. the first column may consist of integers, while the second one consists of boolean values and so on. There is a close connection between the DataFrames and the Series of Pandas. A DataFrame can be seen as a concatenation of Series, each Series having the same index, i.e. the index of the DataFrame. We will demonstrate this in the following example. This was nice, but what kind of data type is our result? This means, we can arrange or concat Series into DataFrames! A DataFrame has a row and column index; it's like a dict of Series with a common index. We will rename the columns of our DataFrame into Romanian names in the following example. We set the parameter inplace to True so that our DataFrame will be changed instead of returning a new DataFrame, if inplace is set to False, which is the default! Instead of replacing the values of the population column with the cumulative sum, we want to add the cumulative population sum as a new culumn with the name "cum_population". We can see that the column "cum_population" is set to Nan, as we haven't provided any data for it. From the previous example, we can see that we have not copied the population column. "p" is a view on the data of city_frame. In this case, it will be definitely better to assign the exact area to the cities. The list with the area values needs to have the same length as the number of rows in our DataFrame.